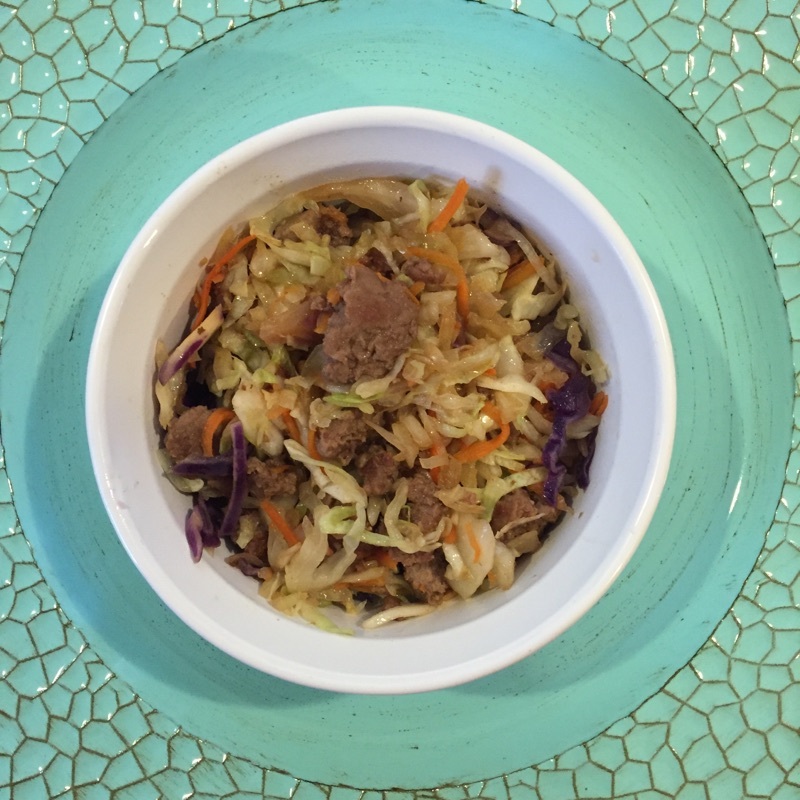 Egg Roll in a Bowl – Mama, Can I Lick the Spoon? As I have stated before, my family loves Asian food. But not every Asian food will work on a low-carb diet since so many things are battered and fried. I love egg rolls, but they aren’t so low-carb. That’s why we love this dish! It’s all the great flavors of an egg roll without the fried wrapper! It’s awesome! In a very large skillet, crumble and brown the sausage over medium-high heat. To the skillet, add the soy sauce, garlic, ginger, and sesame oil. Stir to combine and cook for 2-3 minutes until sauce starts to thicken. Add the cole slaw, just laying it on top of the sausage and sauce. Cover the skillet, reduce heat to simmer for 5 minutes. Remove the lid and stir to combine. Recover and simmer for 5 more minutes. Well Duh #1: You can absolutely divide this recipe in half. I have very hearty eaters, so I make a lot! Well Duh #2: Don’t stand over the sausage and stir it the whole time you’re browning it. Give it some alone time so you get some crispy caramelization! Well Duh #3: I used turkey breakfast sausage – which tends to clump together. Pork sausage will make much smaller crumbles. Well Duh #4: When I added the cabbage, it seriously piled WAY high in the skillet. I could barely get the lid on. That’s why you don’t bother trying to stir it at first. After 5 minutes, it will have wilted enough that you can stir it to combine everything. After another 5 minutes, it should be even easier. 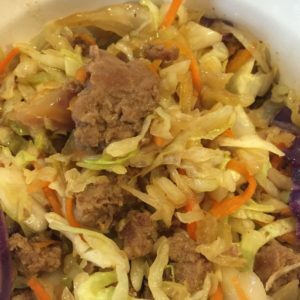 You don’t want to cook it much longer because you want the cabbage to keep a little of its crunch. Well Duh #5: If your skillet doesn’t have a lid, don’t worry. I’ve used a pizza pan for a lid on many an occasion! 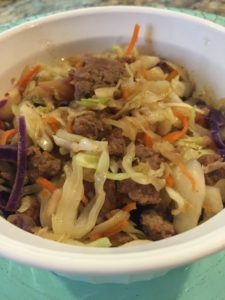 My low-carb tribe ate this up! They really loved it! It was filling and delicious! The egg roll has been unwrapped! I love the new low carb recipes. I’m low carbing! Thanks! Thanks, Tewanna! I hope you find some recipes that you like!